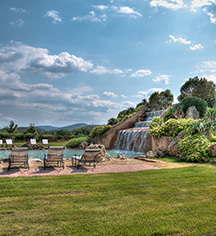 The Hilton Curio La Bagnaia Resort is located in the beautiful rolling hills of Tuscany and is an easy 15 minute drive to Siena. 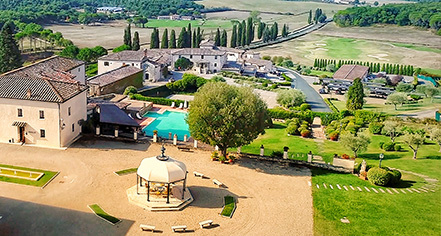 The main area, Borgo Bagnaia, is located on a hillside, up a long driveway, and features several guest buildings, a pool, restaurant, chapel, conference center, and golf course. The Borgo Filetta area is located along the highway, at the base of the driveway to the main area, and has a pizza restaurant. Although we didn't stay in this part, the Borgo Filetta seems far away and potentially noisy by the road. During our stay at the Borgo Bagnaia, the atmosphere was quiet, peaceful, and relaxing. The staff were all friendly, helpful, courteous, and professional. Our room was large, clean, and very comfortable. The breakfast buffet featured the usual mix of breads, pastries, meats, cheeses, fruits, yogurts, cereal, eggs, etc, and everything was fresh and very good. Overall, we had a very nice stay. We just returned from an absolutely glorious trip to Italy and our stay at La Bagnaia Siena Golf and Spa Resort was fantastic! The property is serenity personified; the staff are warm,welcoming and will assist you with making your trip even more memorable. We look forward to returning soon. Nice place to relax and spend a few days away from the busy everyday life. Place is nicely decorated and there is plenty of outdoor space where one can go on walks, play golf, etc. Staff is very friendly and welcoming. Our only disappointment was that, being there in March, there was only one restuarant open and therefore we did not have any choice for dinner meals, since we didn't have a car and taxis were not worth booking to go out just for a meal. Otherwise it is a lovely place to spend a few days in total relaxation. We stayed at the Hilton La Bagnaia for 4 nights - it is a lovely hotel in a stunning setting in the beautiful Tuscan countryside. Siena is only 15-20 minutes away. We had a lovely room in a Tuscan style. The Spa is very nice and the golf looks stunning. Staying at the main property is quite a distance away from the Spa which can be challenging since the Spa does not offer any drinks or food and you need to go back to the hotel if you like anything else but water and tea. Otherwise great place to be!